Returning from the fall practice period, the 98th at Tassajara, a time of zazen, solitude, study―and very little media―into the swirl and intensity of 2017, I encountered the many challenges that are before us, face-to-face. 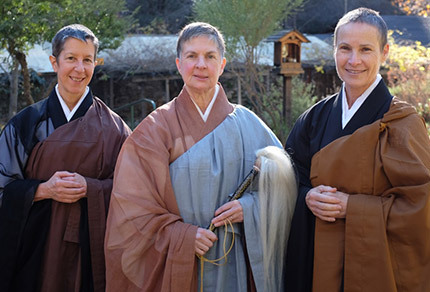 Following the Tassajara Shuso Ceremony in December 2016: Linda Ruth in center with Linda Galijan, left, and Gaelyn Godwin, right. Photo by Shundo David Haye. This coming weekend I, along with SFZC President Linda Galijan and Director of Development Nancy Petrin, will join with a group of women and men, guiding teachers of sanghas throughout the country, zen practitioners and their friends and family, who are traveling to Washington for the Women’s March. I know we will be walking with thousands of others in Washington and throughout the country, and trust that we will walk in peace. This is for me action and expression of standing upright for tolerance, inclusivity, compassion, respect for truth and all beings, and for the care of our precious earth in the throes of climate change—not against particular people or point of view. And I know that many thousands of people from all over the country will also be walking, demonstrating and gathering, sitting and listening to one another―together marking this day and time of change-over, and speaking what is in their hearts. As citizens of this country and the world we are called to express ourselves fully in as many skillful ways as we can. Having just celebrated Dr. Martin Luther King, we know that individuals and groups who are practitioners of a faith have always had a significant and pivotal function in the life of our society and in the life of our communities: standing up for justice, pressing for change, speaking the truth, and calling for those in positions of responsibility to act in a wholesome manner. It seems to me, however, that many people are unclear about the actions that religious groups and non-profits, including SFZC, can take as an organization or as a church. In the effort to be open, inclusive, and welcoming to all, in what way might we be shying away from ethical and moral commitments? San Francisco Zen Center as a “California Religious Corporation” has the right and the obligation to address the issues of our time, with the Bodhisattva Vows as our guide and our stated mission and purpose being, “to express, make accessible, and embody the wisdom and compassion of the Buddha,” in both formal practice settings and in the practice of daily life. Without limits on time, effort and expense, congregations and their representatives may engage in issue advocacy through activities such as educating and mobilizing congregants and the general public. 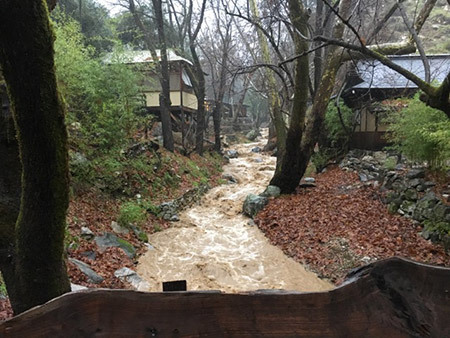 Cabarga Creek flowing strongly, swirling down toward Tassajara Creek after a storm at Tassajara in January 2017. Photo by Greg Fain. Over the years SFZC members as individuals and as part of SFZC groups have marched in demonstrations to curb nuclear proliferation, organized weekly vigils protesting war, have joined with other organizations to support civil rights and the LGBT community, made efforts on behalf of animal rights, and worked to protect the environment, especially concerning issues of climate change. These actions are taken in order to manifest our vows and to enact the teachings based on the example of the Buddhas and Ancestors and to be an example of peace and compassion—not actions of ill will or hatred nor to create more divisiveness. And so I feel strongly called upon to express myself in many ways at this time. The Buddha in his teachings on Right and Complete Speech taught that to practice this part of the eightfold path, a practitioner abandons false speech, divisive speech, harsh or abusive speech, and frivolous talk and idle chatter; and takes up the practice of speaking when something is true and beneficial, when the time and place are appropriate, when there is good will in one’s heart, and when the words are gentle and kind. Also in these very same teachings on Right and Complete speech, the Buddha clarifies that there are times when even harsh-sounding words of fierce compassion may be requisite. We must be fully aware of the particular situation that is manifesting and what is the skillful way to respond. I trust that we will have open discussions on these issues and I welcome your thoughts. Please let us walk together with care and love for all beings, embracing the pathways of a shared life. Please see Linda’s statement after the march in the blog post Women’s March January 21 of January 25, 2017.